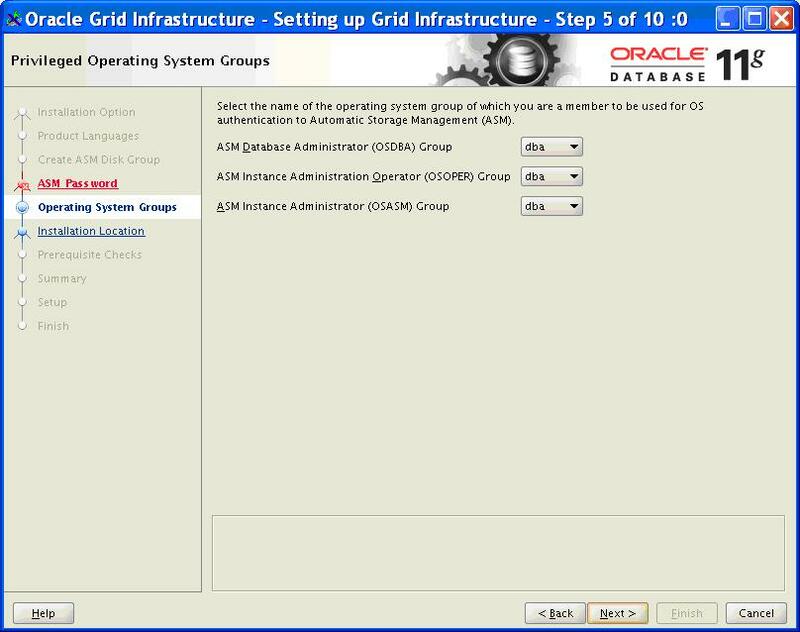 The following documentation provides instructions for building an Oracle 11g database with ASM residing on an Oracle Linux Server (Version 5.3, Kernal version 2.6.18). Use the command lsb_release -id to check the Oracle Linux OS version and uname -r to check the Kernal level. Further reference documentation about Oracle 11g and Oracle Linux is detailed in the Other References section below. This section outlines useful information and changes to previous 10g documentation found on this site. Some have been made for cosmetic reasons, others for more practical considerations. A new deinstallation tool is used for deinstalling Oracle software and databases. 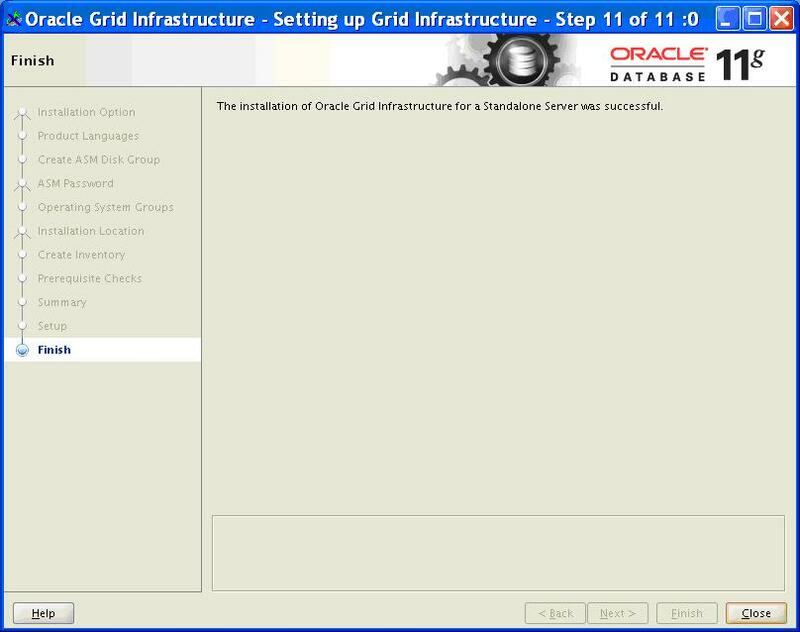 See Deinstalling Oracle 11g section below. On Linux the oratab and the oraInst.loc file is kept in directory /etc. A new directory structure exists. See below. A new init.ora parameter called diag_dest has been set and maps to the diag directory in the new directory structure mentioned above. A listener.ora file has a new parameter called ADR_BASE_LISTENER. This maps to the base of the diag directory. There are a number of new maintenance jobs in 11g. These will be turned off as part of this step-by-step guide. 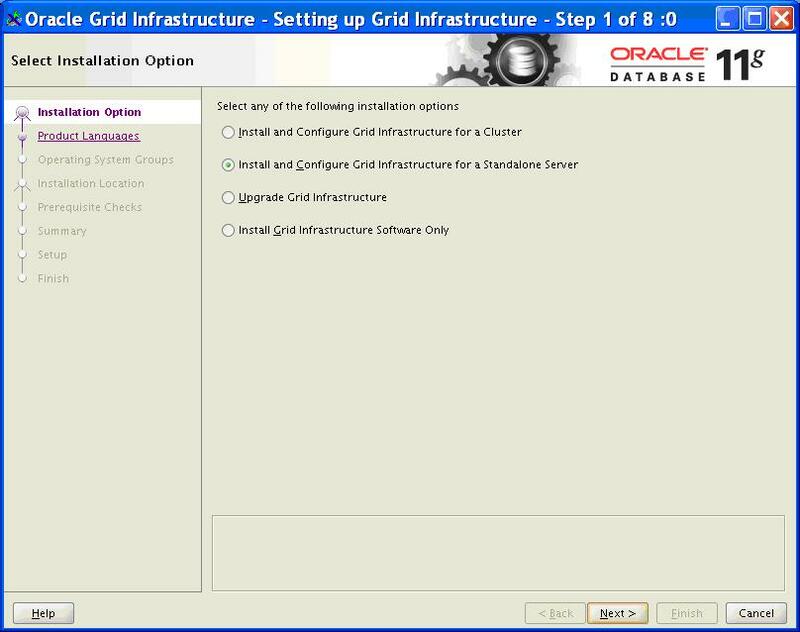 In order to get the database working with ASM, Oracle Grid Infrastructure will need to be installed. 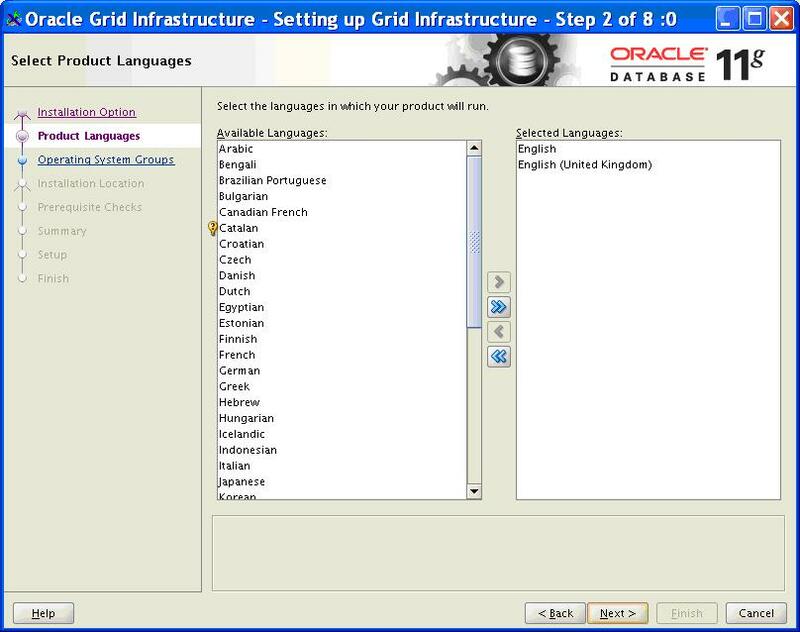 This should not be mistaken for Oracle Grid Control. 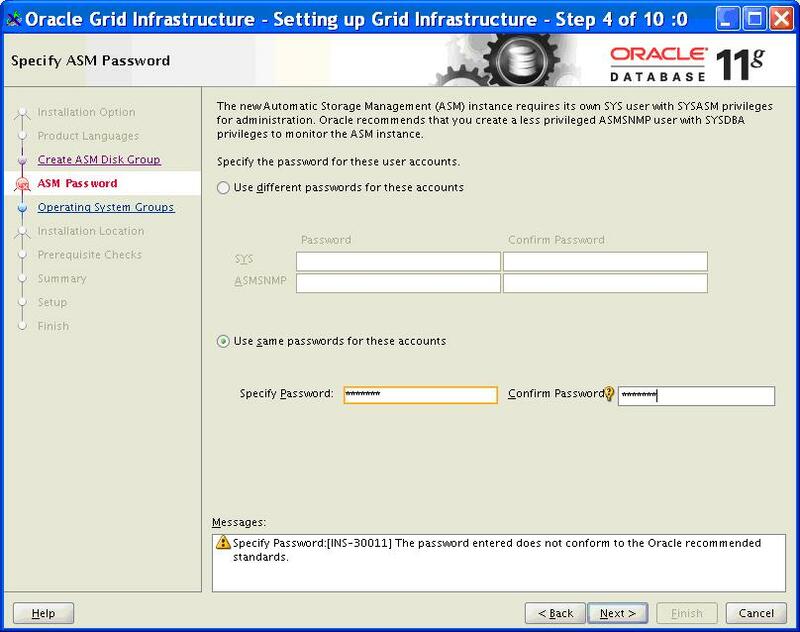 The following guide explains how to install Oracle Grid Infrastructure and any pre-requisite packages like ASMLIB. At the time of writing this guide there are no supported Veritas Cluster agents for database version 11.2. 1. Get a UNIX administrator to check the following Metalink article 169706.1 to ensure that the SE Linux build meets Oracle's requirements. 2. 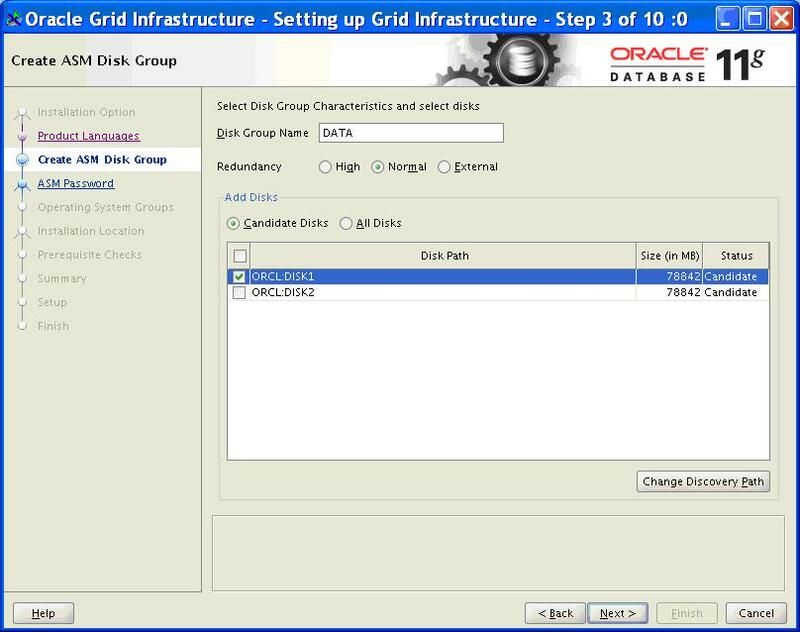 Ensure oracle account and dba group exists. 3. Ensure the Oracle Linux version is 5.3 or higher. 4. Ensure the Oracle Linux Kernal version is 2.6.18 or higher. 5. Ask a UNIX administrator to check that the correct OS packages have been installed as detailled in the Packages for Oracle Enterprise Linux v5 section below. 6. Ensure that SHMMAX is set to 4Gb minus 1 byte. This is to accomodate feature/bug detailled in Metalink nore 567506.1. 8. Get a Unix administrator to set the machine to permissive mode. 9. Check the machine is in permissive mode. NB This is required due to a bug/feature in Oracle. 12. Ask a Unix administrator to create a single partition on each device to be used by ASM. 14. Create and run .profile - see File Listings section below. 15. Ensure the database file systems have been created with correct permissions and have been sized appropriately for the application. - see File Systems section below. 18. Configure the DISPLAY variable. 24. 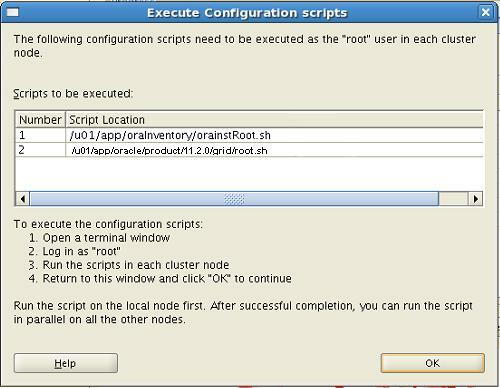 Follow the instructions as demonstrated in the Example ASM Install section below. 27. Alter the disk group attributes to 11.2 compatability. 28. Disable the high availability services. 29. Create the ASM init.ora. Using vi create file $ORACLE_HOME/dbs/init+ASM.ora as defined in the ASM Parameter File section below. 35. Enable, Stop and Start the High Availability Service. 36. Configure the DISPLAY variable. 40. Follow the instructions as demonstrated in the Example Install section below. 41. Configure /etc/oratab file and test using . oraenv command - see File Listings section below. 42. Configure $ORACLE_BASE/admin/SID/create/createdb.sql file, adjusting parameters accordingly - see File Listings section below. 43. 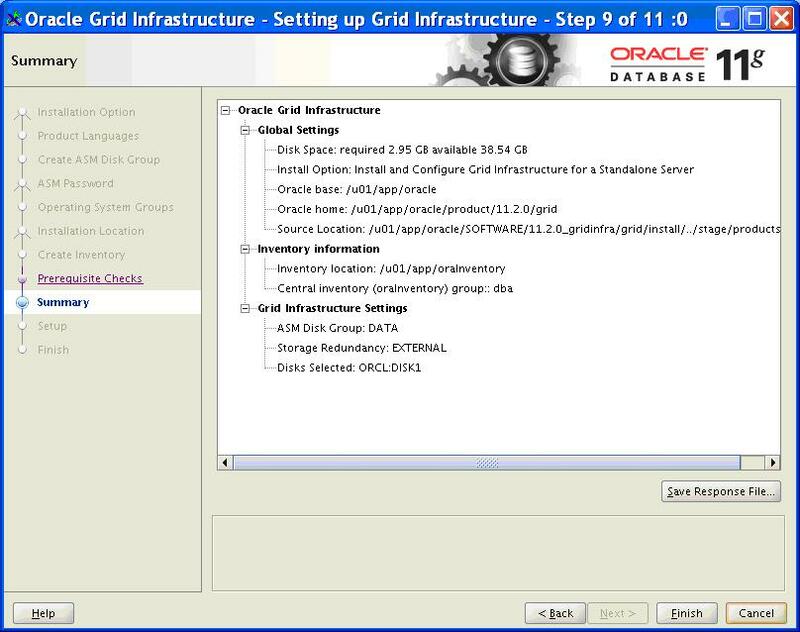 Configure $ORACLE_BASE/admin/SID/pfile/initSID.ora file, adjusting parameters accordingly and create symbollic link to it from $ORACLE_HOME/dbs - see File Listings section below. 44. Remove template init.ora file from $ORACLE_HOME/dbs. 46. Set-up a $ORACLE_HOME/network/admin/listener.ora file as detailed in the File Listings below. 47. Start the listener using the command lsnrctl start. Confirm there are no unexpected errors in $ORACLE_BASE/admin/SID/create/createdb.log. 49. 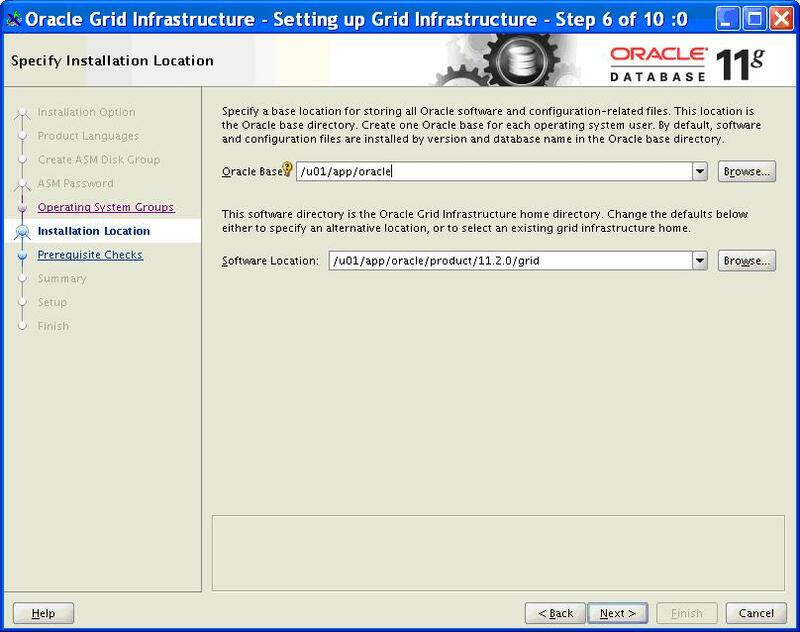 Disable the default 11g maintenance jobs. 50. Confirm database has been recognised by the listener using the command lsnrctl status - this may take a minute or so to occur. 52. Configure $TNS_ADMIN/tnsnames.ora file, adjusting parameters accordingly - see File Listings section below. 1. Adjust the database DEFAULT TABLESPACE settings so that the SYSTEM tablespace is not used inappropriately. 3. Lock and expire potentially harmful built-in user-ids. 2. Remove all database files, binaries, trace files and administration logs using the deinstall tool - see Miscellaneous Section below. -- Usage/Notes : For use with 11g databases. PROMPT Now running CATBLOCK. Please wait…. PROMPT Now running HLPBLD. Please wait…. NB It is assumed that external disk infrastricture will mirror the disks. If not, review this option. Ensure the Candidate Disk radio button is selected. Tick the box next to the candidate disk(s) you wish to add to the disk group. Enter a valid password in the Specify Password box. Enter a valid password in the Confirm Password box. NB If you specified an insecure password, the following message will be displayed. NB These options will be site specific and should be reviewed. Ensure languages Englsih and English (United Kingdom) are selected. Ensure Enterprise Edition is selected. Ask Unix Administrator to run root.sh. - Note: There is a known issue with running this script. See here. This is due to unpublished Bug 9594372, documented in Note 1115493.1 and occurs when running SQL_ANALYZE from a scheduled job. The SQL statement is likely to be similar to the following. /* SQL Analyze(397,1) */ MERGE INTO MGMT_ARU_PATCH_RECOMMENDATIONS p USING .. When running root.sh you are prompted for the local bin directory. The default directory is specified in square brackets. However, due to a bug in the root.sh script this default is not picked up. As a result, you will always need to specify the local bin directory regardless of the default specified within the square brackets. Use the following SQL script if you wish to remove just the 11g database. If you wish to remove both database and binaries, then use the deinstall tool, details of whcih can be found here. With 11.2 the Oracle Universal Installer no longer removes Oracle software. Use the new deinstallation tool called deinstall available on the installation media before installation as well as in the Oracle home directory after installation. When prompted for the database name enter the *SID* you want to remove. The tool should now complete okay after performing several tasks. See example output below. The following output is example output for removing a standalone database and the related binaries. The Oracle Base directory '/u01/app/oracle' will not be removed on local node. The directory is in use by Oracle Home '/u01/app/oracle/agent10g'. The Oracle Base directory '/u01/app/oracle' will not be removed on local node. The directory is in use by central inventory. Successfully detached Oracle home '/u01/app/oracle/SID/product/11.2.0' from the central inventory on the local node. Successfully deleted directory '/u01/app/oracle/SID/product/11.2.0' on the local node.